This book focuses on parental commitment to family life after divorce, in contrast to its common perception as an irrevocable breaking up of the family unit, which is often perpetuated by representations from popular culture and the media. In the first detailed review of emotions and emotion work undertaken by divorced parents, the author sheds light on how parents manage feelings of guilt, fear, on-going anger and everyday unhappiness in the course of family life post-divorce. 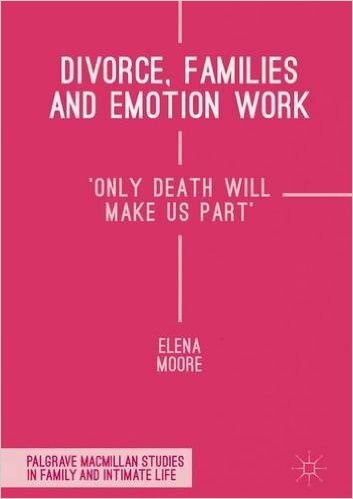 Moore demonstrates how the emotional dimension of divorce is shaped by societal and structural factors and requires parents to undertake considerable emotion work in the creation of new moral identities. The book points to the often gendered responsibilities for sustaining family lives post separation, and how these reflect extensive inequalities in family practices. The author concludes that divorce is not dangerous for society; it is not a social evil or a demonstration of the rise of selfish individualism, and that divorcees remain committed to former partners and children long after divorce. This book will be of interest to scholars and students in the areas of Sociology, Psychology, Family Studies, Social Policy, Social Work and Law.